Is it time to replace the pool cover? Swim season 2018 is knocking at the door. Yay for that! However, before the season comes around you may be wondering, “is it time to replace the pool cover?” Sure, your pool’s winter cover will be coming off soon, but will it be viable for another swim season? Have you checked the pool cover you will be using this summer? How old is it? How many seasons have you used it? Was it stored correctly throughout the winter so that it survived the season? Check it now. 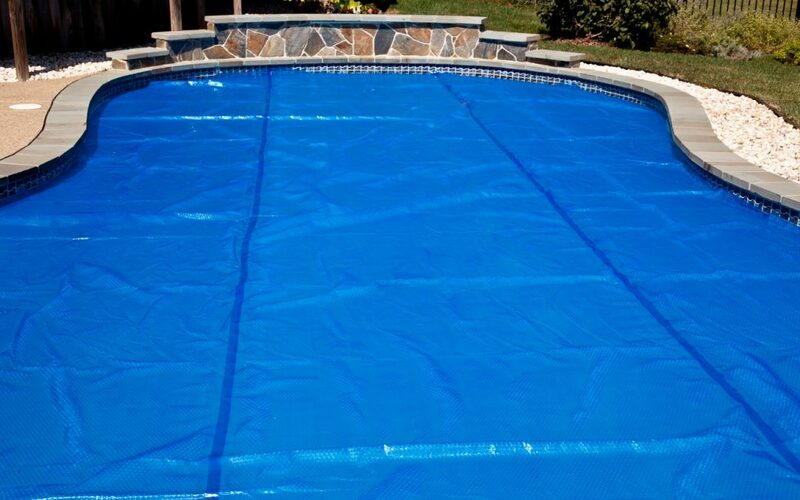 You may be able to buy “last year’s model” pool cover and save some money. Having a swimming pool, means you should have a cover for it. Using a pool cover diligently will offer many benefits for your pool and here are a few to consider. Consider a pool cover an investment in the pool and the money you’ve spent. A pool cover shouldn’t be an afterthought or an accessory. A pool cover, truly is a necessity to protect your pool, save money on pool chemical usage and to help cut back on evaporation. If you have children or pets in the house, a pool safety cover will add an additional layer of protection between them and the water. Decide what type of cover you want, talk with us to assure you have the correct size and then determine whether you need a pool cover lifter device to aid in its use.